This recipe is not one from the annals of history in our family, but one of my own. The texture of the muffin is a little denser than regular muffins; it's a little more bread-like, and one muffin is very filling. The texture of these makes them an excellent "toasting" muffin (cut them in half, and brown them (or "toast" them) in a toaster oven (yes, people still do use those and you can still buy those), topping them off when they're done with butter (or honey, or even peanut butter). They have a rather nice flavour, too so you can eat them alone with nothing. At least if you like (and aren't allergic to) nuts and raisins. This recipe uses three types of flour - unbleached all purpose, whole wheat cake & muffin flour, and quinoa flour. To be honest, I'm not a huge fan of quinoa flour for baking, so it isn't something I use very much, but there are times when I'll substitute a portion of the "called for" flour with quinoa flour (a lesser amount). If you don't have it, or don't want to use quinoa, replace it with an equal portion + 2 tablespoons of the whole wheat flour, or double the amount of all purpose flour. 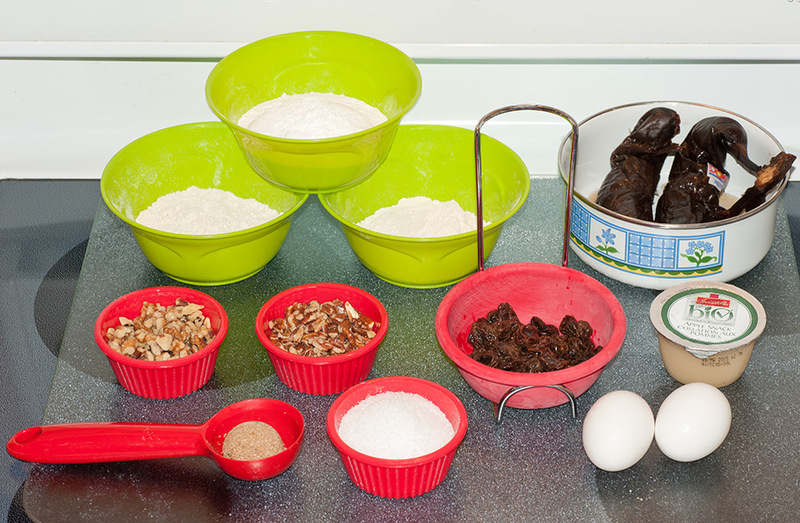 Although it seems like a lot of ingredients, putting the batter together is pretty quick because basically you toss all the dry ingredients into one bowl, mix all the wet ingredients in another, then add those to the dry ones, adding the nuts and raisins last. Oh, and about the bananas - yeah, I know they're black. 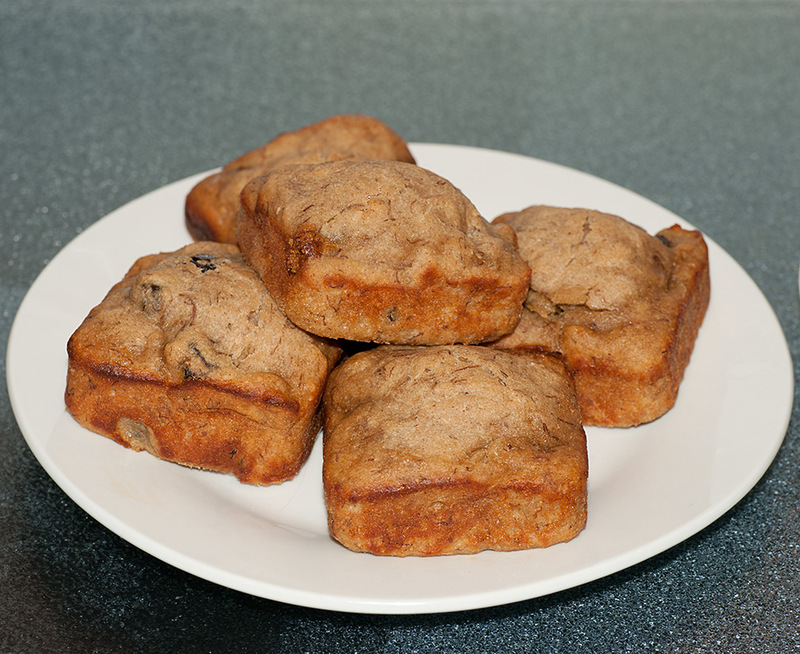 Most people who bake "banana anything" will toss their over ripe bananas into the freezer. Getting a banana out of it's skin after it's thawed is very easy - slips right out, and is very easy to mash up. The recipe itself can be easily altered - if you like a "Morning Glory" type muffin, add finely grated carrot and apple; if you can't eat nuts, replace them with chocolate chips. 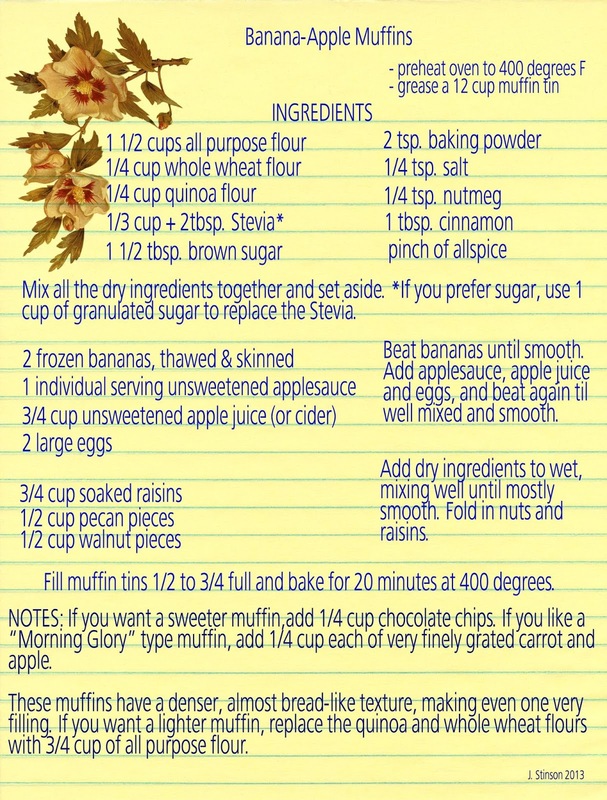 If you like a sweeter muffin use an additional tablespoon of brown sugar, plus 1 additional teaspoon of Stevia (or, 2 tsp. of granulated sugar). The muffin tin I used is square, and the square cups are very large and deep, so with these muffins, I fill them only half full, otherwise ... well, otherwise you'd have a muffin so large and dense you'd only want half. I do have the regular round muffin tins, but ... well, I like being different. 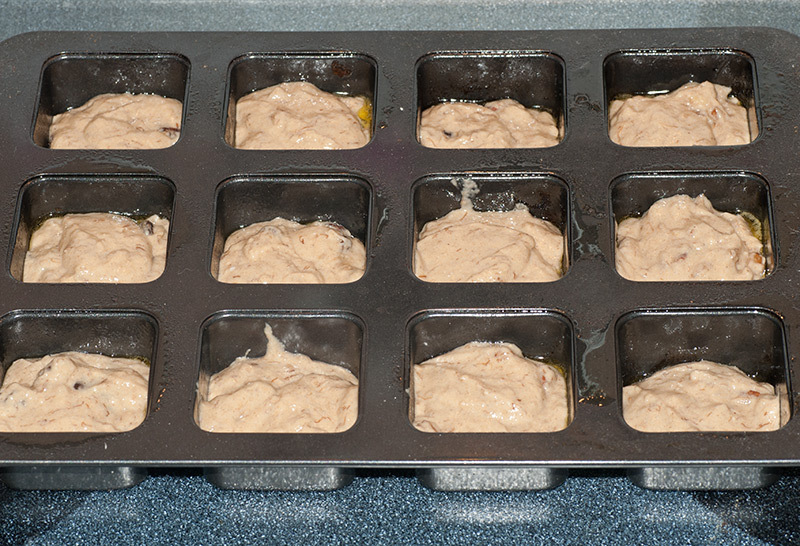 These also work well for bite-sized (or two-bite) muffins if you have the small muffin tins - I use those a lot for other muffins too. My husband ... well, he was a little unsure when I put the first one in front of him. He kept saying how good they smelled baking, and I think he was expecting ... well, your average muffin. This isn't it. He did concede after trying it that it was good ... that's a guy for ya. If your stomach has the grumblies, this muffin will fix that. 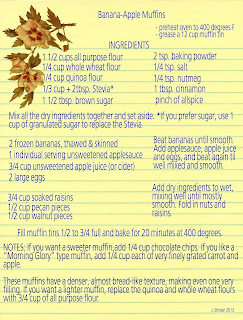 The calories in this recipe (if made as given exactly in the recipe) amount to a total of 2094, divided by 12 muffins gives you a total of 175 calories per muffin, which is a whole lots less than the lowest calorie Tim Horton's Muffin (low fat - 2 choices) which is 290 calories, while their Banana Nut Muffin is 420 Calories! If you were to use a small muffin tray with 24 bite-sized muffins, each muffin would be less than 100 calories. You can reduce the calories in these muffins even more - reduce both types of nuts from 1/2 cup each, to 1/4 cup each (saves 31 calories per muffin). Use only egg whites (3, instead of 2 whole eggs and don't "beat" the egg whites, just mix them) will reduce the calories in each muffin by 10. Making those two minor adjustments will give you a muffin with only 134 calories in it. 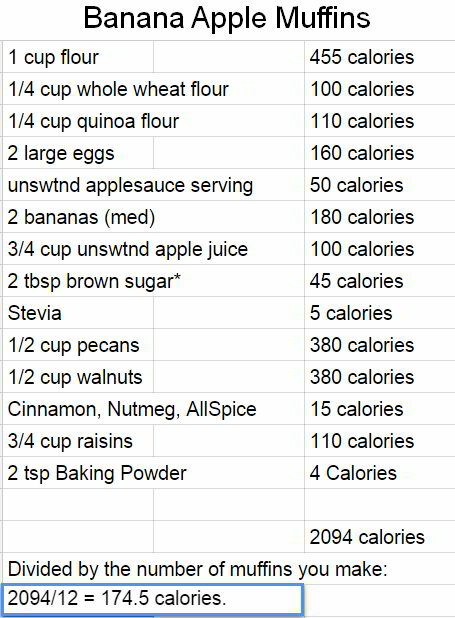 Below is a sheet with the breakdown of calories per ingredient. Using this sheet, you can make adjustments to the calories by reducing the total by the number of calories you remove from the recipe, or adding new calories for added ingredients (like carrot or apple).